A friend who sympathized with my video game addiction and penchant for all things Atari, game me this gem of a device. Far from being a laptop or any sort of gaming machine, I was facinated by it since seeing Edward Furlong rip off ATM machines with it in Terminator 2. One can't help but wonder what Atari might have stumbled onto if it had further developed this handheld device. 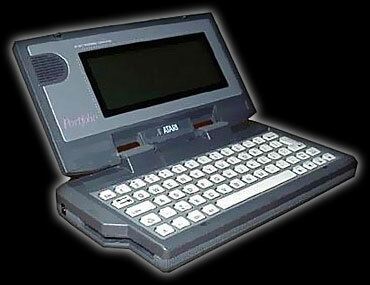 The Atari Portfolio is the first PC-compatible palmtop computer, and was released by Atari Corporation in 1989. The Portfolio was licenced from Distributed Information Processing (DIP) based in Guildford, Surrey, England. The original founding member of DIP was Ian Cullimore, fresh from his experiences at helping design the early Organiser products at Psion. DIP officially stood for "Distributed Information Processing", although secretly it actually stood for "David, Ian and Peter", the three founding members of the company, all ex-Psion. The original founder of the company (first called "Crushproof Software") was Ian Cullimore, and the other two David Frodsham and Peter Baldwin. It was built around an Intel 80C88 CPU running at 4.9152 MHz and ran a variant of MS-DOS called "DIP DOS 2.11". It had 128 kB of RAM and 256 kB of ROM which contained the OS and built-in applications. The on-board RAM had to be divided between system memory and local storage (the C: drive). The LCD was monochrome without backlight and had 240x64 pixels or 40 characters x 8 lines. There was an expansion port on the right side of the computer for parallel, serial, modem or MIDI expansion modules. It used a card expansion port for removable memory, which was not compatible with PC card as it predated that standard. Expansion cards were available in sizes of 32, 64, and 128 kB initially, and later were available in capacities up to 4 MB. The expansion cards were backed up by a replaceable battery, which lasted approximately two years. Built-in applications included a text editor, spreadsheet (Lotus 1-2-3 compatible), phone book and time manager. Expansion cards contained programs such as a chess game, a file manager, and a finance manager. Most text-based MS-DOS applications could be run on the Portfolio as long as they did not directly access the hardware and could fit into the small memory. Other expansion modules included a floppy drive, and a memory expansion unit. The memory expansion unit gave the Portfolio an additional 256 kB of RAM, which can be partitioned into several drives. It also featured a pass-through expansion connector, allowing the use of more than one expansion unit. In theory, multiple memory expanders can be attached, increasing the available storage to over 640 KB. There was also a card reader available that connected to a desktop PC to read and write to the expansion cards. The kit contained an ISA card, a special cable, the card reader, and software distributed on floppy disk. Also, using the parallel port expansion module, a standard parallel cable and the software supplied (DOS based), the Portfolio can be connected to a PC for transferring files to and from the unit. Credits for the development of the product can be found in the "back door" on the Portfolio - go into Setup, then Help, then press Alt+[ ("Alt" plus "left square bracket"). The Portfolio still enjoys some popularity today. Many people value them for their strict simplicity and lack of unnecessary features. In addition, several hacks have been made for the Portfolio, including an accessory that allows the use of an electroluminescent backlight on the unit. Another interesting hack is the Portfolio CompactFlash modification. By modifying the RAM card slot and fitting a CF-socket and a small circuit (a 74 series chip and a bit of buffering) CF cards can be used (albeit in partitions no larger than 32 MB each due to limitations of the ROM DOS). The Portfolio appears in the film Terminator 2: Judgment Day, where it is used by the young John Connor to bypass security on an ATM with a ribbon cable connecting the Portfolio's parallel interface to a magstripe card. This setup also appears a second time in the movie, when John uses it in the Cyberdyne Systems lab to retrieve the key to the vault containing the arm and CPU of the first Terminator.